The terms and conditions of a Stipulation in the Santa Maria Valley Groundwater Basin Litigation passed down by the Superior Court of the State of California, County of Santa Clara, on June 30, 2005, are intended to “impose a physical solution establishing a legal and practical means for ensuring the Basin’s long-term sustainability.” Under the Stipulation, the groundwater, imported and developed water, and storage space of the Basin are to be managed in three management areas, including one for the Santa Maria Valley (SMVMA) (Figure 1). The management area is approximately 175 square miles in size encompassing the Santa Maria and Sisquoc Valleys, extending north to the Nipomo Mesa, east to the cliffs above the Santa Maria River and terraces along the Sisquoc River, south to the Casmalia and Solomon Hills, and west to the coast. 3) accounting of amounts and methods of disposition of water utilized. This monitoring program has been prepared to meet these objectives in the SMVMA. Also in accordance with the Stipulation, it is expected that the monitoring results will be utilized for preparation of annual reports on the SMVMA, including an assessment of whether conditions of severe water shortage are present. 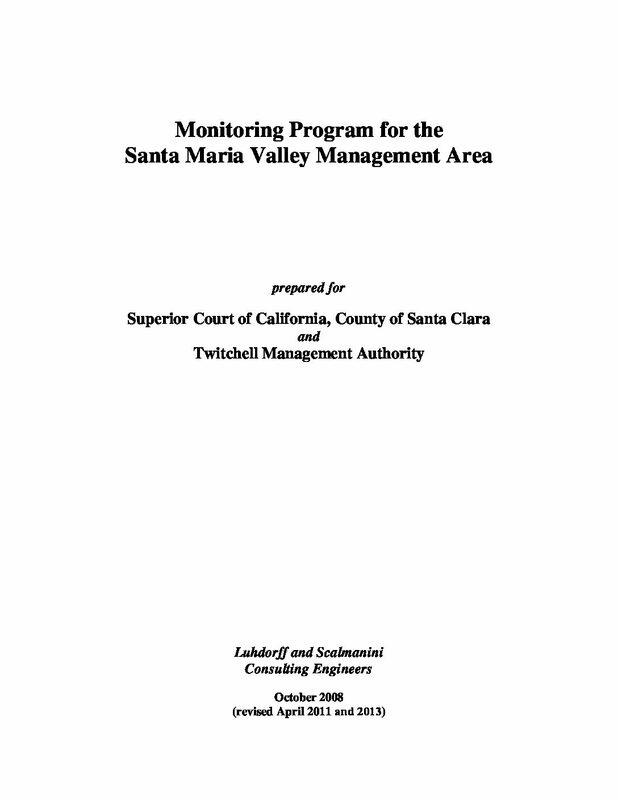 The monitoring program for the SMVMA, with minor revisions from October 2008, is described by individual element in the following section. Among other components, the monitoring program includes networks of historically monitored wells, stream gauges, and climatic stations. These monitoring points were selected based on publicly available information about their locations, characteristics, and historical data records with the intent of continuing those records as much as possible. It is recognized that, as implementation of the program proceeds, the inclusion of some network wells may be determined to be impractical or impossible due to problems of access or abandonment. Further, the reestablishment of inactive (or installation of new) wells, stream gauges and climatic stations will depend on interagency coordination, permitting procedures, and budgetary constraints. Thus, it is anticipated that the overall monitoring program will be incrementally implemented as practicalities like those mentioned above dictate. Similarly, it is expected that, with time, the program will undergo modification in response to various factors (e.g. 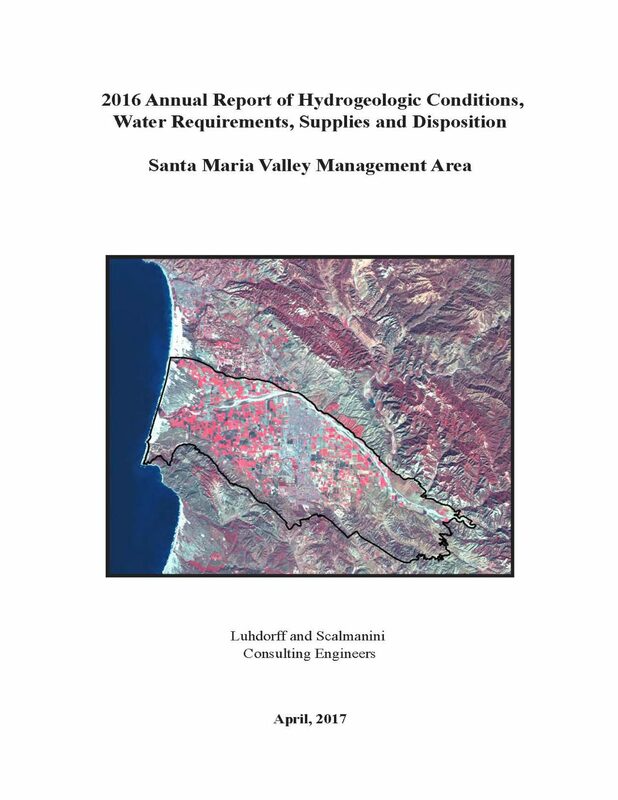 replacing network wells abandoned in the future, revising well classifications by aquifer depth zone), while maintaining the overall goal of facilitating interpretation and reporting on water requirements, water supplies, and the state of groundwater conditions in the SMVMA.